Perhaps not. 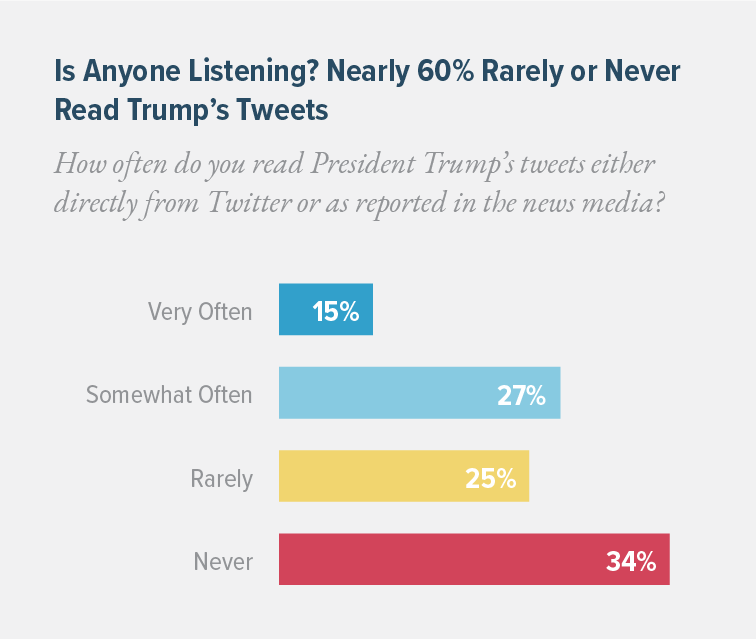 The 2018 Public Affairs Pulse survey shows that nearly 60% of Americans rarely or never read President Trump’s tweets, either via Twitter or the news media, and only 15% read his tweets “very often.” Among people who approve of the president’s performance, just 15% are regular readers. The poll of 2,200 Americans, developed by the Public Affairs Council and conducted by Morning Consult in late August, examines a wide range of topics related to business and society. These include public opinions about U.S. vs. foreign-based companies, the most trusted sources of political news, which industries are gaining and losing trust, and which ones are considered under-regulated. So why do Trump’s social media rants draw so much attention? It’s partially because the news media magnify his comments when he says something controversial. But, in addition, 50% of self-described liberals and 46% of Democrats do read his tweets and tell friends and family about them. In comparison, only 43% of Republicans and 36% of Independents read the president’s tweets at least somewhat often. Only 37% of Americans without a college degree read his missives, but 51% of those with at least a B.A. degree do see them. It turns out that Twitter may not be an effective strategy for the president to communicate with his base. The poll shows that only one out of four people who strongly approve of Trump’s job performance regularly reads his tweets. Frequent readership is even lower among rural Americans (14%), Republican women (11%), and evangelical Christians (15%) — three key demographic groups for the president. Soon after Trump’s inauguration, the Guardian newspaper called him “The first Twitter president of the United States.” But POTUS didn’t wait until Jan. 20, 2017, to lob criticisms at major U.S. firms Boeing and Lockheed Martin. In the weeks and months that followed those early attacks he derided Nordstrom, Merck, Amazon (at least four times), Facebook, Harley-Davidson, CNN and a host of other companies. Understandably, these firms were worried about sudden drops in stock prices, the loss of government business and long-term damage to their reputations. And some spent significant amounts of time and money trying to figure out how best to respond. After all, this type of crisis had never happened before. 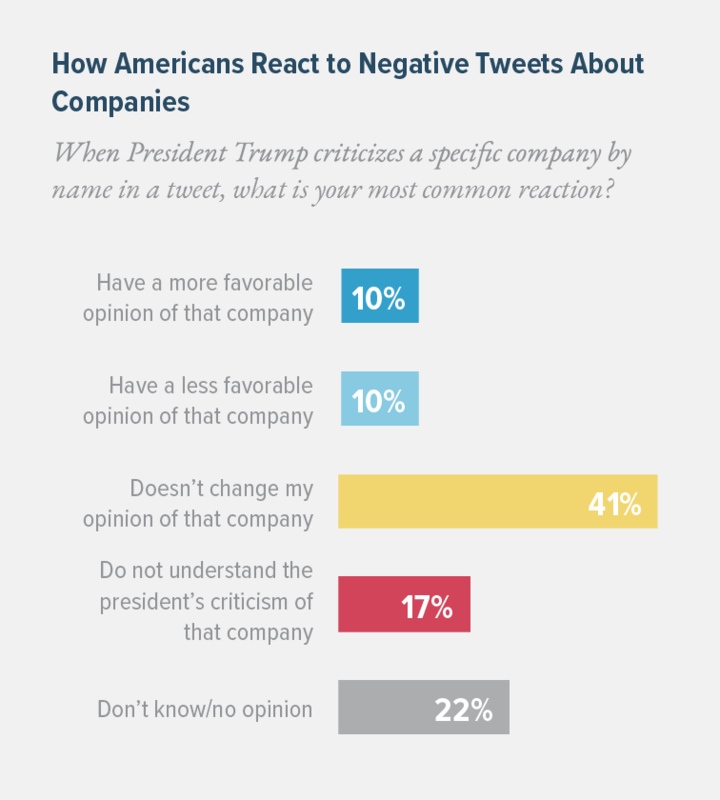 Yet, research now shows that when Americans encounter the president’s criticisms of specific companies, the vast majority (80%) don’t change their opinions, don’t understand Trump’s criticism, don’t know how to react or simply don’t care. While 10% say they have a less favorable opinion of a company once it is attacked by the president in a tweet, an equal percentage say they actually have a more favorable opinion. Groups most likely to be persuaded by the president’s reproaches include Republican men (26%) and people who strongly approve of Trump (27%). Groups most likely to take the opposite view — and favor a company more after it has been criticized — include Democratic men (21%) and Americans who care about women’s policy issues (22%). As one would expect, a healthy percentage (30%) of those who strongly approve of Trump say they have a less favorable opinion of a person called out in a negative tweet. But, overall, when President Trump criticizes an individual by name, that person is just as likely to gain popularity as lose popularity. Eleven percent say they have a less favorable opinion of the person in Trump’s sights and 12% have a more favorable opinion. As with tweets about businesses, a large majority of tweet readers don’t change their opinion or don’t know what to think. Among certain demographic groups, there is a net positive effect associated with being picked on by POTUS. Statistically speaking, if someone wants to become more popular with young people, Democrats, African Americans, Hispanics or Jewish Americans, he or she might want to find a way to earn the ire of the president. In fact, a Democratic candidate seeking to appeal to voters who care about education, energy, healthcare and women’s issues could benefit significantly from a negative Trump tweet. Doug Pinkham is president of the Public Affairs Council, the leading global association for public affairs professionals. The Council, which is both nonpartisan and nonpolitical, has more than 700 member companies and associations. You can reach him at dpinkham@pac.org.